There I was, thinking I was fairly knowledgeable on the topic of musical instruments, having studied music all through my school career, playing some myself and having played in an orchestra for a few years, but you learn something new every day. When we’re all together in the car the kids usually attempt to negotiate which music we should listen to but since Ironman is usually the driver he claims the right to choose the music, which I generally don’t mind unless Dr Hook’s “Sylvia’s Mother” gets repeated for the seventeenth time in a row at which point intervention is required. On long trips the kids have conceded defeat in the music department and listen to their own with earphones but on shorter trips if I’m driving I’ll often get requests for certain music (usually if they don’t like what I’m listening to) and, depending on the mood I’m in I’ll either let them change the music or I might say that I prefer to keep listening to whatever had been playing. On one such day when I was listening to “The Best of Creedence Clearwater Revival” – one of my favourites – Child No 3 piped up: “This is such bogan music” and when I, very surprised, laughed and asked her why she called it that, she replied that it sounded like “a washboard and a banjo”. I could imagine why she would say “banjo”, but “washboard”? 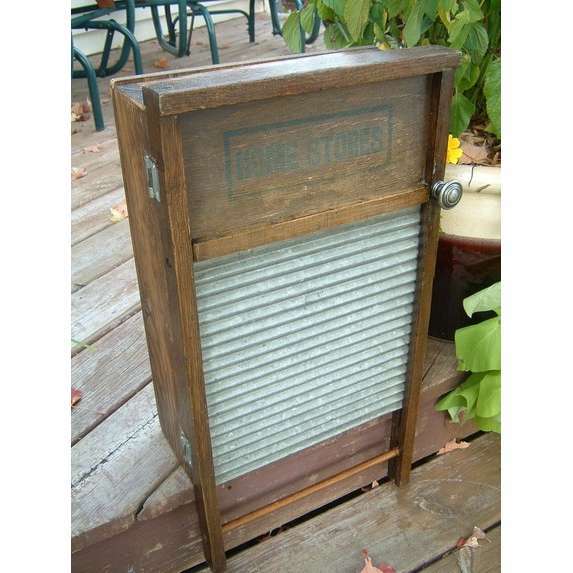 That olden-day board that was used to hand wash clothes on? For the life of me I couldn’t hear it. Try as I might, my brain just wouldn’t match my visualisation of an olden-day clothes-washing board and the sounds I was hearing. I brushed the comment off and didn’t give it too much thought until the following time we were listening to CCR and she sighed and said again: “This really sounds like a washboard and a banjo”. By this stage I was quite intrigued although a bit dumbfounded because I just couldn’t hear that clothes-washing board until eventually I decided I’d better find out why she’d called it that and tried the method my generation passed school without – Google – and learnt that “washboards” are also musical (percussion) instruments. Well what do you know, I’ve learnt something new. I wasn’t going to concede anything on the “bogan” part though – I must be a true bogan at heart then, I said to her. Music is such a personal thing and tastes are as varied as are people, I realised again with the CCR episode. What appeals to one might not appeal to another. I grew up in a home where we listened to a great deal of classical music and I like a very broad range of music. My kids don’t all share my love of classical music and my husband only on the very odd occasion but my playlist includes anything from Mozart to Van Morrison and Coldplay to Queen and evidently, some bogan music to top it off. The kids have asked me on more than one occasion what my favourite song is but I have many and can’t choose only one. Music lovers all understand how it has the power to move, bring people together, lift spirits, relax, let you be creative, make happy, inspire, motivate (all the music-listening exercisers out there can vouch for that), and it equally has the ability to make us feel melancholy, nostalgic or sad. I read somewhere once that “music is what emotions sound like” and I thought it such a brilliant analogy. Anyone who plays music in one form or another, or sings, will understand the power of expression it gives, whether it’s solo or in a group. Some of my musical highlight memories are of times doing just that. Whilst being “inside” the music that’s being produced it’s impossible not to feel moved or lifted. I have the greatest admiration for the genius of musical masterminds – writing and creating music from nothing is something I’ll never be able to do. I’m very fortunate that one of my children, No 2, shares the same love of music and she’s taken the bold step to go busking (with a proper busking licence) in the city and she’s made some handy pocket money that way, singing and playing her guitar. She just doesn’t want any of us to go and watch but dad ignores that and sometimes surprises her as he walks up, stops and drops some money in her case. Me, I’ll just keep tickling the ivories (preferably when no-one is listening), and happily listening to my “bogan” and other music.